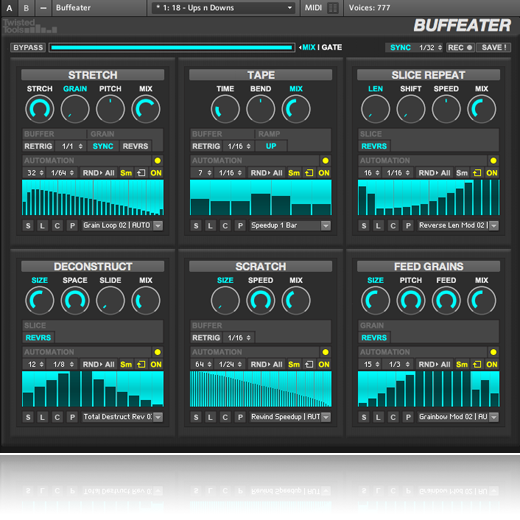 Buffeater is a real-time, dynamically ordered, granular multi-effect for all versions of Reaktor 5. The effect works by capturing live audio and storing it in a temporary buffer, which allows for real-time processing of the incoming audio using granular synthesis and other methods. Buffeater allows you take live audio and tweak elements of the sound such as time and pitch, while controlling he signal flow of the effects by the order in which you play. With Buffeater, you can easily achieve stutters, glitch, beat repeat/juggling and/or chopped and screwed effects. The package size for this download 274.2mb zipped, so please allow yourself ample time to download the file if you are on a slow internet connection. On a very fast connection, you should be able to download the package in about 7-10 minutes. Made something using Buffeater? Leave us something using our dropbox in our community area and vote for the best submission.. Winner takes home a Twisted Tools T-shirt of their choice and a copy of Vortex or Colorflex (or credit if you own both already).